Two wonderful guests in town, a lot of running around and visiting, and I still managed to finish Aunt B's socks on Saturday night, while watching a sweet movie with my girls. My mom and soon-to-be-sister-in-law were in town for a truly fantastic visit. They were here because they were throwing a wedding shower for lil ole me with my sis. What a great party - it was so perfectly lovely- the food, the drink, the company, but talk about emotional. I feel like I have either been giggling like a hyena (do hyenas giggle or do they guffaw? because, honestly, there was a little bit of both) or leaking tears from my eyes since they arrived on Wednesday. Aren't women fantastic? I love my S - I can talk to him about anything and everything, can cry to and with him, and laugh until my sides feel fit to bust, but there is something about having your girls around to really get the waterworks going. This weekend has been good for the soul. To start out with, I am in love with these socks. They have the right amount of bounce, of give, of stretchiness. I really want to keep them. They will be a lovely gift. They fit me like a dream. Aunt B will heart them completely. I will send them in the next few days. It will be painful, but it will be done. I promise. I worked the pattern until about 1 inch from where I wanted the cuff to be, then began working a p2, k3 rib to keep in step with how the faux cable works (on a multiple of 5 stitches). It looks really fly. Of course, I have yet to take photos of the finished socks, but I will soon, possibly tonight, and will share the beauty. Elfine Pattern (my sis called these "Elfine Love Socks," which I really really heart - whattaya think, WG?) 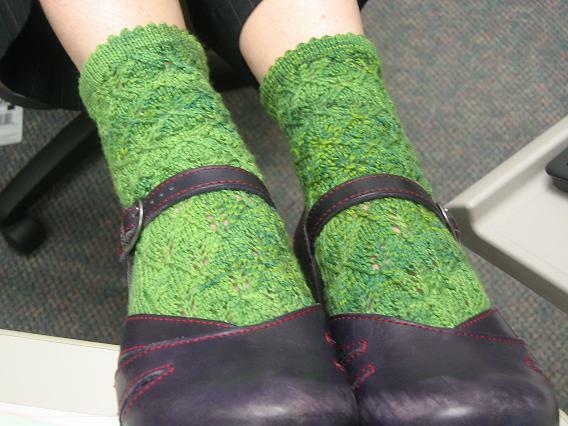 with Sundara sock yarn in Leafy colorway. She made them a bit shorter than the original pattern, and, get this - ADDED A PICOT EDGE TO THE TOP. Thank you from the bottom of my heart, WG! oh, wg, come ON! don't make me cry at work - doncha know i have been emotional lately?!?!?!?!?!?! these socks feel so fantastically perfect on my feet! Sounds like too much fun. I never had a sister of my own, so I'm always intrigued by them. I used to study the Brady Bunch girls for clues. At least I'm lucky enough to have a few SILs now. Beautiful Elfines! I just received a pair of those from my Sockapal3za pal and they are I.N.C.R.E.D.I.B.L.E. They're the best fitting socks I have yet. And I just finished the first of a pair of them for a friend of mine, too. We miss your mom! When are you going to send her back? I bet you'd like to keep her there. Shannon, those socks are GORGEOUS!! Stunning!!! They are beautiful on you!! WG, you did an amazing supercalifragilisticexpealidocious job on them!! I heart the picot edge!!! And the color screams "Shannon"!! !